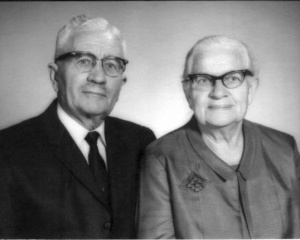 [[File:BrandtJohnAnna.jpg|300px|thumb|right|''John and Anna Brandt'']] John K. Brandt was born 3 September 1891 in the village of Wasilovka, [[Naumenko Mennonite Brethren Church (Kharkiv Oblast, Ukraine)|Naumenko Colony]], South [[Russia|Russia]]. He was the tenth child born to Kornelius and Margareta (Rempel) Brandt. Five older siblings had died in infancy. A younger brother also died in infancy, leaving John as the youngest in a family of five. Not too long after the Kornelius Brandt family moved to [[Saskatchewan (Canada)|Saskatchewan]], John made a commitment to Christ and later was baptized and joined the [[Greenfarm Mennonite Brethren Church (Herbert, Saskatchewan, Canada)|Mennonite Brethren Church in Greenfarm]]. Following Christ became a significant part of John Brandt's life, and church involvement was a natural outgrowth of this commitment. John Brandt taught for 31 years in several school districts in Saskatchewan and then also in [[Manitoba (Canada)|Manitoba]]. Along with teaching the usual subjects, Brandt always pursued his musical interests and led school [[Choirs|choirs]], bands and/or orchestras. In 1947 the Brandt family moved to Chilliwack, British Columbia. Here John again bought a farm, expecting his sons to farm. However, neither he nor his sons relished farm life. Soon an opportunity to teach in a Bible school arose, and John was glad to become involved. For a number of years he taught in the [[East Chilliwack Mennonite Brethren Bible School (Chilliwack, British Columbia, Canada)|East Chilliwack Bible School]] and also at the South Abbotsford Bible School (the forerunner of [[Columbia Bible College (Abbotsford, British Columbia, Canada)|Columbia Bible College]]). Teaching music and directing choirs was a source of great joy for John. John Brandt taught for 31 years in several school districts in Saskatchewan and then also in [[Manitoba (Canada)|Manitoba]]. Along with teaching the usual subjects, Brandt always pursued his musical interests and led school [[Choirs|choirs]], bands and/or orchestras. In 1947 the Brandt family moved to Chilliwack, British Columbia. Here John again bought a farm, expecting his sons to farm. However, neither he nor his sons relished farm life. Soon an opportunity to teach in a Bible school arose, and John was glad to become involved. For a number of years he taught in the [[East Chilliwack Mennonite Brethren Bible School (Chilliwack, British Columbia, Canada)|East Chilliwack Bible School]] and also at the South Abbotsford Bible School (the forerunner of [[Columbia Bible College (Abbotsford, British Columbia, Canada)| Columbia Bible College]]). Teaching music and directing choirs was a source of great joy for John. Brandt, Gilbert G. "Brandt, John K (1891-1972)." Global Anabaptist Mennonite Encyclopedia Online. September 2002. Web. 25 Apr 2019. http://gameo.org/index.php?title=Brandt,_John_K_(1891-1972)&oldid=91214. Brandt, Gilbert G. (September 2002). Brandt, John K (1891-1972). Global Anabaptist Mennonite Encyclopedia Online. Retrieved 25 April 2019, from http://gameo.org/index.php?title=Brandt,_John_K_(1891-1972)&oldid=91214.